It is with sadness we learn that Andrew passed away on Friday 8th March 2019, our sincere condolences go out to his family, friends and former colleagues at this time. Andrew worked in Passenger Services at LGW from 1972-1975. He then moved to Reservations in the BCal Town Office on The Rokin; Amsterdam. He was 69 years old. Andrew went on to work for BA, but recalled in his Crewroom entry that the 3 years at Gatwick with BCal were the best by far. From Richard Friend : Sad news. Nice guy. RIP Andrew. My condolences to his family. From Jenny Kempa : Dear Andrew, I was only just back in touch with you! So sad. So very sad to hear the news. Such a lovely guy with a great sense of humour. RIP Andy. Sad passing of yet another friend and colleague. Sad news. We last met Andrew four years ago at Hazel and Adrian Lane’s house and as always he was the life and soul of the party. Farewell to a fun guy. I was Manager Netherlands for BCAL 1984 -1988 and Andrew was the Reservations Supervisor in Amsterdam up until the take over by British Airways. He was very much respected by the Dutch Travel Trade and noted for his helpful attitude and constant good humour. The transition to BA was far from easy in Amsterdam but Andrew was one of those that remained extremely positive throughout the process and helped to facilitate a relaxed merger of the two teams. It was this professional attitude that earned him the respect and friendship of the BA Sales and Reservations staff. He was a real credit both to BCAL and BA and a true airline professional. I am therefore very saddened to learn of his passing. I worked with Andrew at Gatwick and in Amsterdam. He always made me laugh and we had so much fun. A true legend. RIP, Andrew. 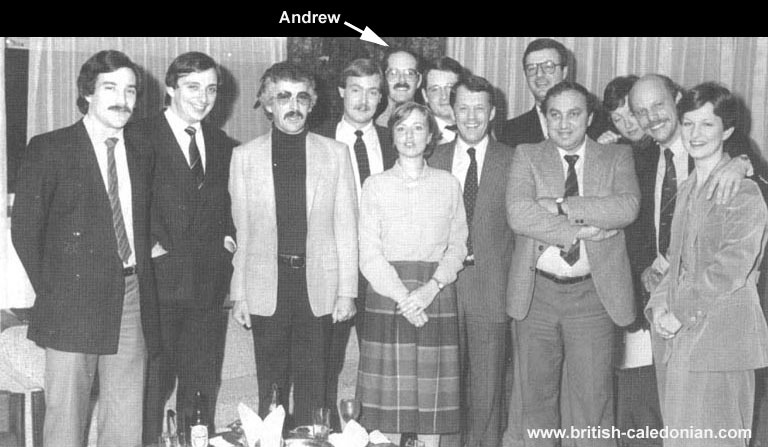 It is with great sadness that I read about Andrew’s passing. Andrew was such a wonderful colleague, one with a great heart. We worked at the AMS office at Reservations between 1976-1977. I remember one particular trip to The Hague on a Saturday afternoon to meet a travel agent. We had such a wonderful day, a day I will always remember. RIP dear Andrew. So sorry to hear about Andrew. He was a lovely guy to work with. We were so sorry to loose him to the AMS office. My condolences to his family. Andrew's service will be held in the Netherlands, where he had lived since BCal days. Following the service his ashes will come to the UK with his brother so he Andrew be laid to rest with his mother, as per his wishes.